Wind and solar energy are gaining a lot of attention in the renewable energy business, but what about geothermal energy? Heat from the bowels of the Earth can also be good for something, right? 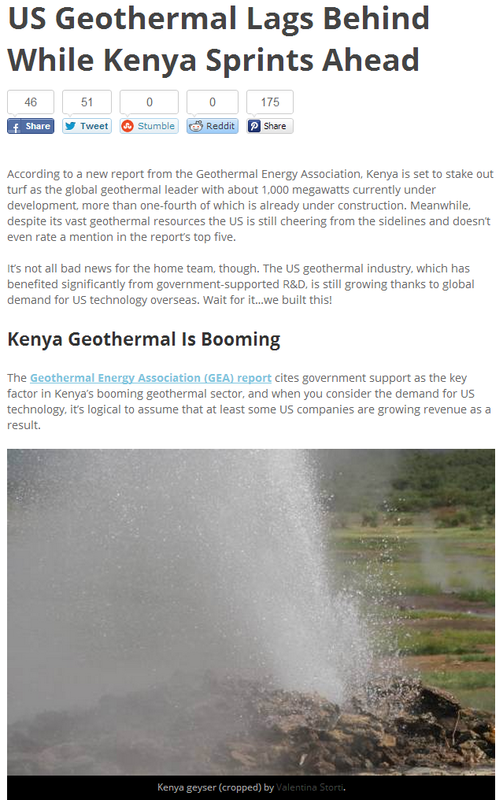 Geothermal energy currently produces less than one percent of the world’s energy, but several countries like Kenya and Turkey have begun investing in this energy source. Kenya plans on making the most out of its 10,000-kW potential to cut energy costs and invite more investors. Meanwhile, Turkey aims to draw 30 percent of its energy from renewable sources in ten years’ time. The U.S., until recently, has barely touched the issue of geothermal energy despite its greater energy potential at three million megawatts. Expansion, advocates say, is badly needed. However, a significant expansion of the US geothermal sector would be a nice thing, too. The US is an acknowledged global leader in geothermal potential, as underscored by a recent Google geothermal survey revealing about three million megawatts in hand. The stunted growth of geothermal energy in the U.S. has been an issue in previous years. The regions around the Rocky Mountains contain vast, rich hydrothermal sites from which geothermal energy can be produced, according to the Energy Information Administration. Currently, California is the largest producer of geothermal energy at more than 2,500 MW. In response, the government stepped up its projects through the Department of Defense. Earlier in 2013, the U.S. Army Corps of Engineers was awarded a $7-billion contract to construct geothermal facilities in key military facilities and other properties owned by the DoD. They expect for the military projects to serve as a pattern for civilian ones in the future. As with any application that involves steam, geothermal technology will benefit greatly from the small players in the system such as quality Sarco steam traps. As steam produces condensate, the steam drawn out from geothermal reservoirs may cut precious heat and, with it, energy. Steam traps discharge condensate to keep steam’s full energy potential. In another scenario, substandard steam traps may cost industries thousands every month in energy loss. Leakage on a steam trap with a half-inch orifice may leak more than 800,000 lbs of steam per month, with an estimated loss of more than $4,000 monthly. Reliable Sarco steam traps supplied by companies like ALB Industrial prevent this unnecessary loss in energy and profit.